Back in the days when I was jetting around the world doing mission work, it was a common practice for me to hand out gospel tracts. I developed my own tract in the form of a million dollar bill. One side has a picture of Jesus with the message “Jesus Christ died for you! 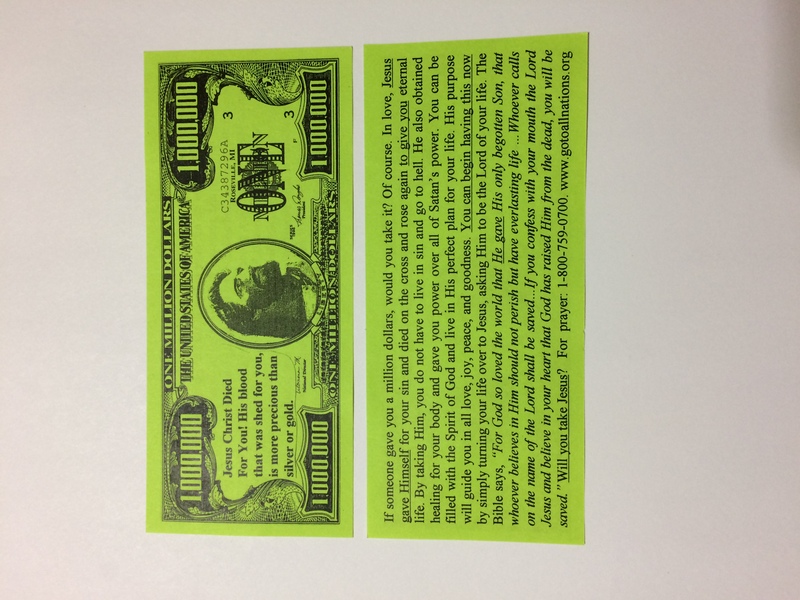 His blood that was shed for you is more precious than silver or gold.” The flip side asks “If someone gave you a million dollars, would you take it?” I then go on to explain on the tract how that in love Jesus died for us and rose again to give us eternal life. I then explain that by taking him you can have your sins forgiven, be filled with the Holy Spirit, have healing in your body, power over Satan, and live in God’s plan for your life. John 3:16 is quoted, and I quote the place where it says if you confess with your mouth the Lord Jesus and believe in your heart that God has raised him from the dead you will be saved…For whosoever calls on the name of Jesus, will be saved (Romans 10: 9, 13). It ends up by asking, “Will you take Jesus?” Then it gives a phone number and a web site. One time when I very politely passed out tracts to all of about 175 passengers on a large jet before we took off, I had an interesting response. I started at the beginning of the first class section after everyone was seated. Most everyone received the little green piece of paper with acceptance. I wanted them to have something to muse on for the flight. But when I got to the very back of the plane the last person I handed the tract to was a lady, who when she saw what it was and read the front side of it, she went ballistic. Up she came out of that seat in a rage, cussing and sputtering and carrying on. The Stewardess came and quieted her down as I went to my seat. 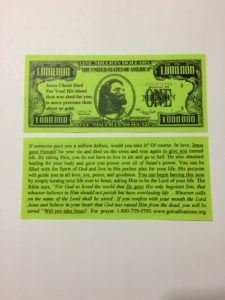 Later in the flight, the Stewardess came to me and told me not to worry, that I could pass out gospel tracts on her plane anytime, and that there is usually one person like that in every bunch. The early church suffered persecution, and the church in parts of the world today suffers persecution for freely getting the gospel out to all people. With that experience on the plane it seems the stats run that out of about every 175 people, there’s going to be one greatly offended at you getting the gospel out freely to all. Multitudes gladly welcomed and benefitted from Jesus’ ministry, but probably about 1 out of every 175 were greatly offended and persecuted him. He did not let the ballistic ones stop him. Neither should you and I.